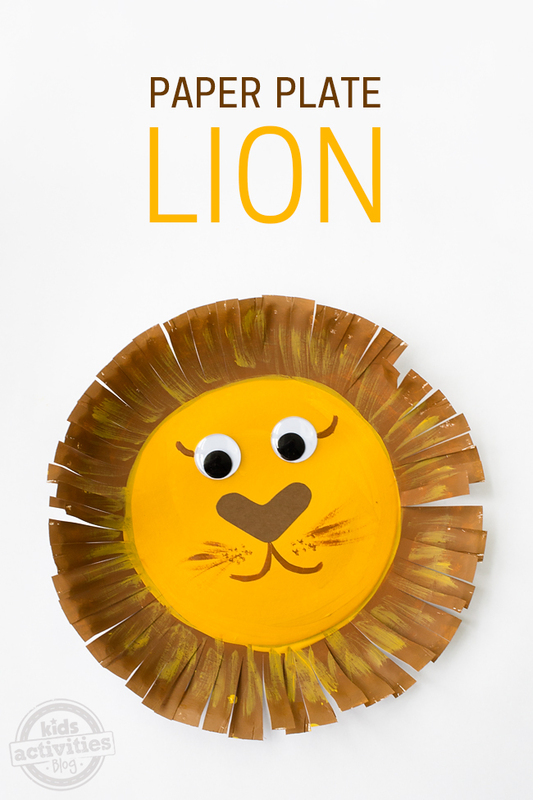 Are you a fan of making crafts out of recycled materials? These paper bag coiled baskets might be right up your alley. To make them, you will need a few simple materials that you probably already have laying around your house. Related: If this kind of recycled craft appeals to you, I bet you’d love these 30 cardboard box crafts too. 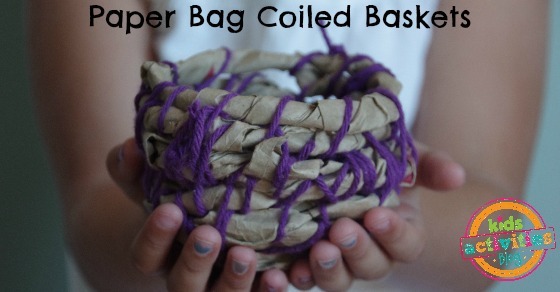 These coiled baskets made from a paper bag are fun to create, but they do take a bit of patience. I found this was a craft done best when I was able to help my 5 & 7 year old. Older elementary age kids could probably manage making these on their own. The kids will love having a sturdy coiled basket to keep their most beloved trinkets. Cut down one seam of a brown paper bag. Cut off the bottom portion of the bag. You are left with a long rectangular piece of paper bag. Cut the remaining bag into three-inch strips. We did this by measuring 3 inches and then folding to create a guideline for cutting. 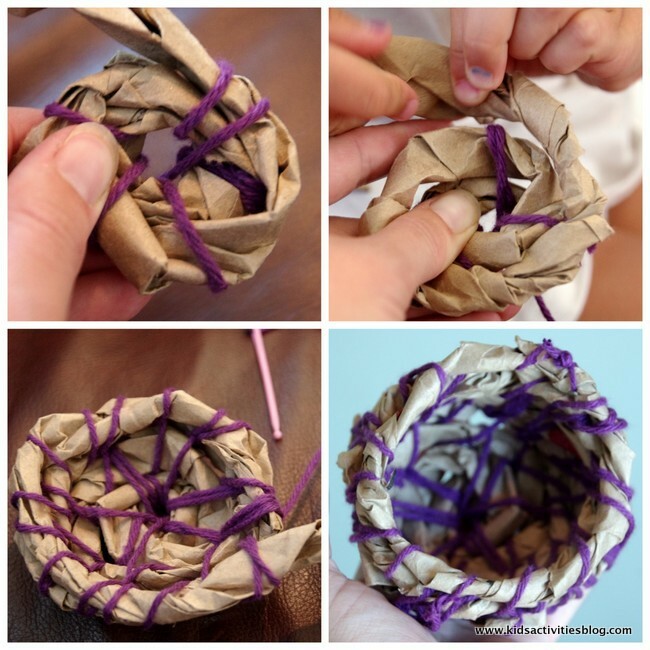 To make a small basket you will use one paper bag cut into three strips. Twist the strips of paper. 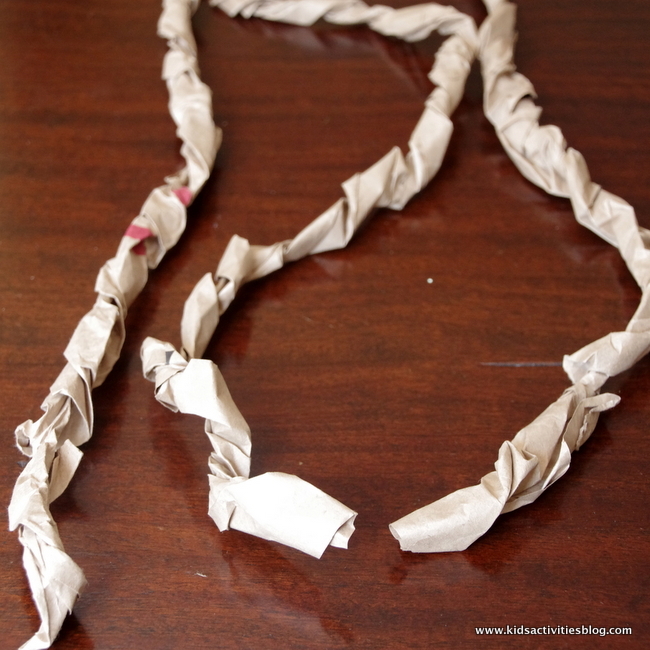 We found this worked best when I held one end and my daughter twisted the paper bag. She would start toward where I was holding and work her way down until the entire strip was twisted into a paper rope. 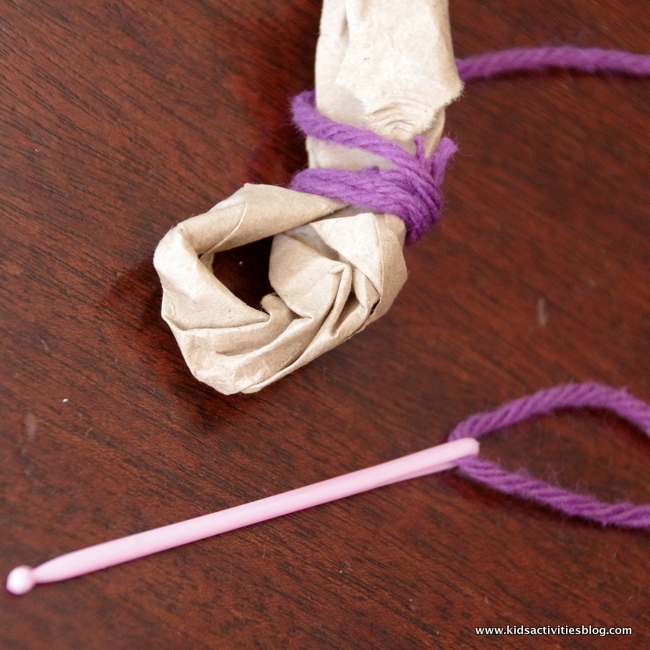 Take your yarn and thread it onto your needle. Form a small loop at the end of one of your twisted ropes. Tie the yarn around the base. Twist it around a number of times and then tie a knot. This part was best done with two people. I was coiling the basket around while my daughter was weaving the needle and thread through. Begin coiling and weaving. Coil the paper rope around once. Work the needle around the coil and through the loop you created in the center. Make another “stitch” a little distance apart from the first. Our stitches ranged from 1/4-1/2 inches apart. Continue to make stitches around the first coil. Coil the paper one more time, making it slightly larger than the first time around. Continue the stitching process, returning to the center hole. After creating a few coils and returning to the center hole in stitching, you will begin to stitch the coil on top to the coil directly underneath. Continue as your basket gets bigger and bigger. When you run out of “rope” twist another paper bag rope onto the last. This will take a little extra securing with the yarn (a bonus stitch or two where the two ropes join together). You can make your basket as large as you like. Simply keep going with the process until you have the desired size. To finish the basket, knot the yarn with an attached rope and trim off any excess yarn. Your kids now have a great basket for holding their special things. 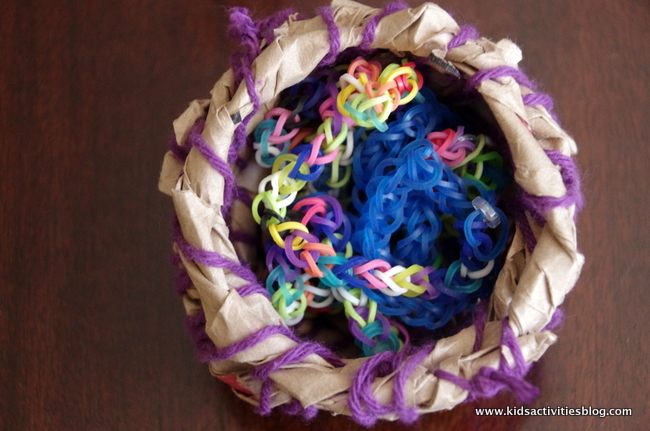 We decided it would be a great basket to hold my daughter’s rainbow loom bracelets. This craft takes diligence, but the results are a lot of fun. I hope you are inspired to go and collect the materials from around your house to make this craft happen. 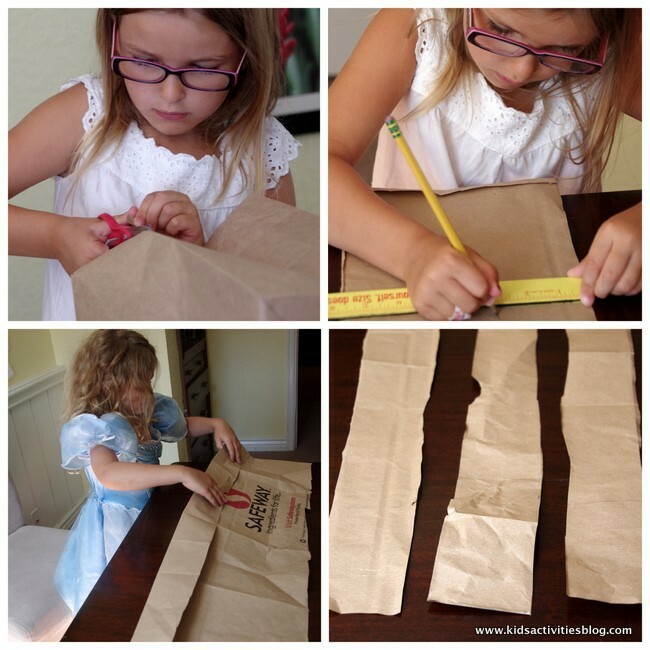 If you enjoy using paper bags to create things with your children, I’m sure you would also enjoy this paper bag city, paper bag lion, discovery bags or make these DIY bunny ears. 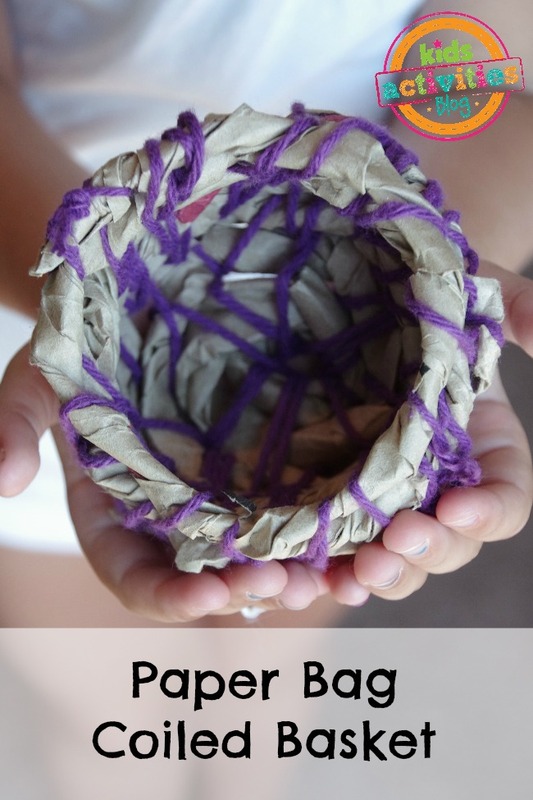 Leave a comment: What do you plan on using these Paper Bag Coiled Baskets for? Paper Coil baskets is pretty awesome. I tried making it myself its awesome. I have also get the beautiful from Lowes.